Gluten free pizza is a delicious reality at Flyers Pizza. During my research for the “Visit Columbus” article for Gluten Free and More Magazine, I was tasked with the challenge of finding all the places around central Ohio that served gf food. On my visit to Soodles Bakery, I learned that many pizza places around Columbus use their allergy friendly crust! Flyers Pizza was one of those places! The Soodles pizza crust is really good, but it’s what each pizza place does with the dough that makes it really delicious. The Flyers Pizza near me allowed me to come in and visit their kitchen. This is always a welcome opportunity for me, because as a person who can’t eat gluten, I love the peace of mind that comes with actually seeing how gluten free food is prepared and served. If you ever get the opportunity to tour a kitchen before you eat in a restaurant, take it! A good kitchen that understands cross-contamination will welcome you in to see the kitchen. I think that Flyers does a great job of controlling cross contamination in their restaurants. It was also really cool to see the inner workings of a pizzeria kitchen. There is a lot going on back there, and Flyers kitchen was clean, organized, and well-run by the management. I was most impressed by the dedicated ingredients, dedicated area and dedicated methods used to make their gluten free pizza. 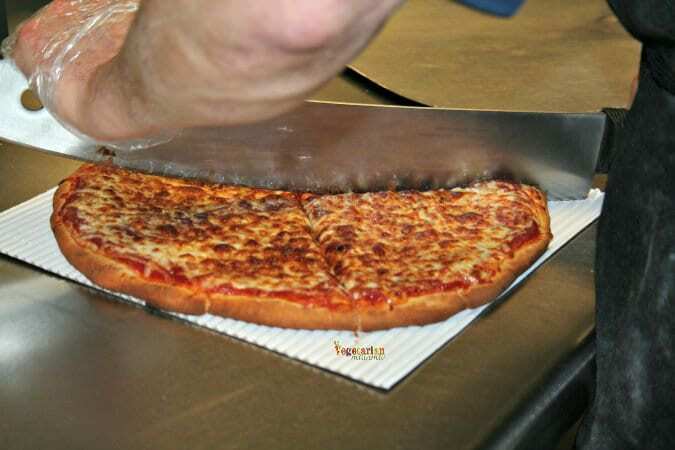 Creating a gf pizza in a gluten filled area can be quite the task, but Flyers has all the right procedures in place for people who are gluten sensitive to enjoy a gf pizza! Seeing the gluten free pizza making in action gave me great confidence that Flyers was a place that my son and I could eat safely at. 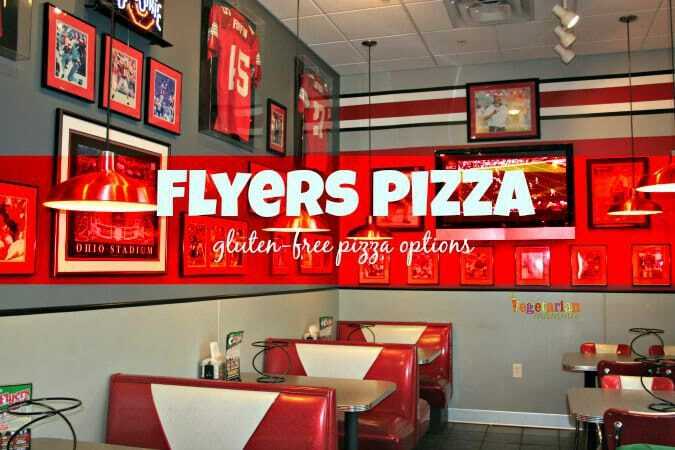 Flyers pizza menu includes much more than gluten free pizza too. My husband and older son, who aren’t gluten sensitive, really enjoy their garlic breadsticks. They are brushed with garlic butter and dusted with parmesan, oregano, and seasonings. The order of breadsticks includes sauce for dipping too. So yummy! Flyers also offers fresh salads, sandwiches, and starters. 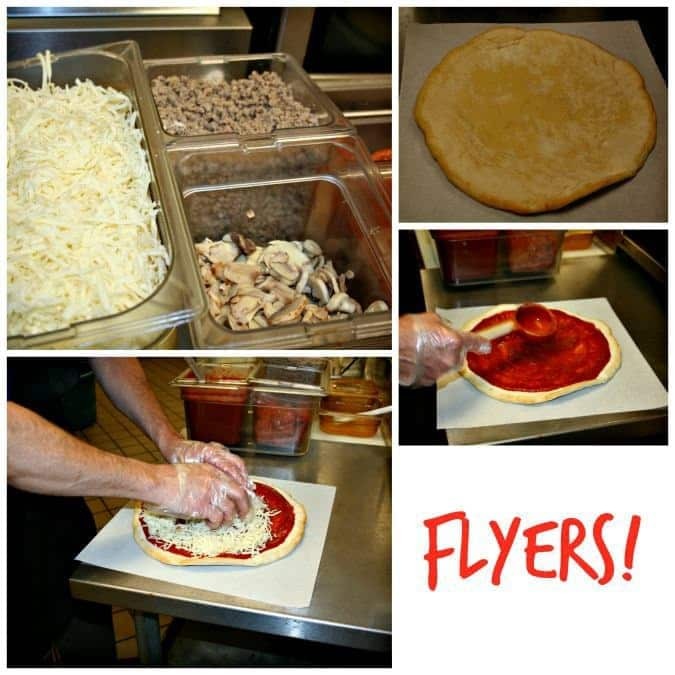 Everyone will find something they like on Flyers Pizza’s menu. 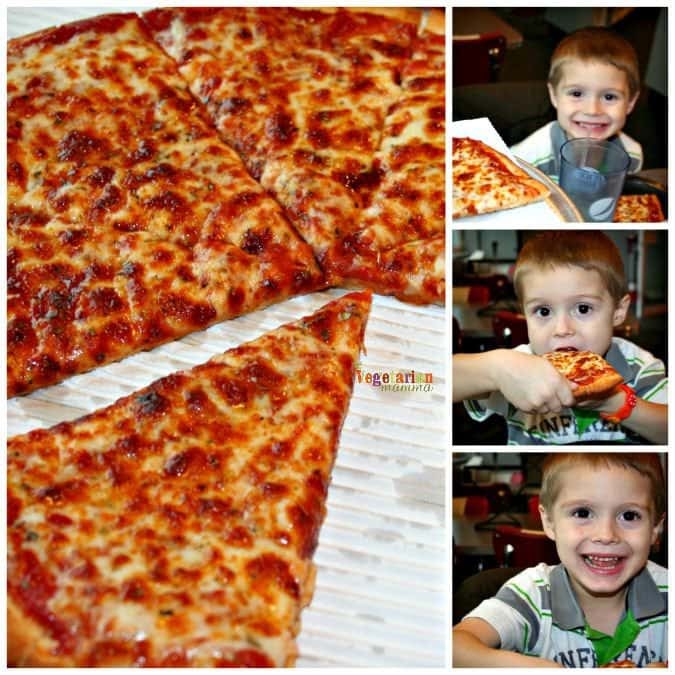 This kid LOVED his cheese pizza from Flyers. Raising a gluten sensitive child can be tough sometimes, because there are lots of foods that other kids are eating that he just can’t have. Having a gluten free pizza option nearby that makes him this happy makes me a happy mamma! When asked what the best part of this pizza is…it is hard to pick just one. The crust is amazing (Thanks Soodles!) And the sauce is top notch as well! We typically order our pizza with just cheese, but I sometimes like to get half with green pepper and red onion. Of course, if you eat meat, you’ll find traditional pepperoni and sausage on the menu too. You really have your choice of any pizza toppings. The speciality pizzas offered at Flyers look amazing too! You will just have to head in to one of the 8 locations in and around central Ohio to get a taste! Leave a comment below telling me your favorite pizza toppings! To learn more about Flyers, check out their website or go visit the location closest to you. This is my absolute favorite GF pizza. And, I am so glad they are right down the street from me. Thank you for sharing the details on how careful they are!